I'm stopping in today to share my newest layout using the June 2016 Hip Kit & Add-On Kits from Hip Kit Club! 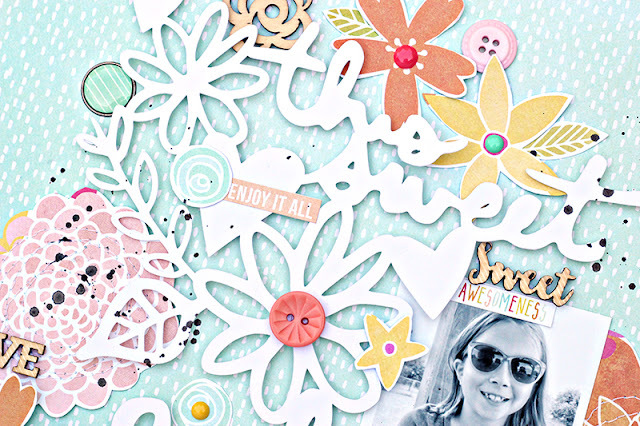 Flowers, fussy cutting and cut files...these are just a few of my favorite things, and I incorporated all of them into my layout. I chose several of the Simple Stories ‬ papers from the June 2016 Main Kit for my layout. I wanted the cut file, cut from White cardstock to pop against the Teal background paper. And I loved the pops of color from the fussy cut flowers, that I layered over and under the cut file. This layout ended up with a lot of fun dimension and texture. I added several of the Jillibean Soup wood veneers for a textural contrast, as well as some of the Simple Stories brads and enamel dots. I love to work in as many embellishments as I can from the Kits, so I also used the Crate Paper rubber charms from the Bloom‬ collection and one of the Chipboard phrases from Heidi Swapp. And I couldn't resist using some of the cute buttons from the Pink Paislee ‪Fancy Free‬ collection. I love how well the colors coordinated with the Simple Stories Sunshine and Happiness collection. I wanted just a touch of spray mist on the layout, so I sprinkled on Black Color Shine to add a little bit of a graphic look to the layout. If you're looking for fun ways to use the Hip Kit Club monthly cut files, then make sure you stay tuned each Tuesday for a new layout. And if you want to see the process for the layout, you can check out my new YouTube video, showing how I altered the cut file in Silhouette Studio.